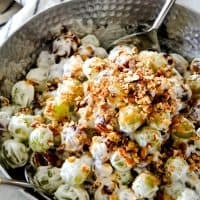 Refreshing Grape Salad packed with grapes in a silky sweet cream cheese dressing. You can make this salad ahead of time for the perfect stress-free potluck or dinner side that everyone will love!. Beat cream cheese, sour cream granulated sugar and vanilla extract until smooth. Fold in grapes until evenly coated. Cover with plastic wrap and refrigerate for at least one hour, best if overnight. Just before servings, sprinkle with brown sugar and pecans.